Sorry, this entry is only available in English, Deutsch, Français, Italiano, Español, Português, Русский, Polski, čeština, slovenský jazyk, Nederlandse taal, Dansk, Türkçe, 中文 and 日本語. For the sake of viewer convenience, the content is shown below in this site default language. You may click one of the links to switch the site language to another available language. Inspire the audience with your music and win prize money totaling 11.000€ with your composition – take part in the Progressive Classical Music Award 2019! Compose new music for two violins that goes under the skin and sweeps audiences off their feet. There is no limit to your imagination. Using virtuosity or simply great emotionality– always remember that the audience has to be touched or carried away! The style does not matter. Playing technique should be challenging, unconventional, with new effects, nice melodies, extreme sounds or hot rhythms – let your imagination run wild! Additionally for prizes 1-3: One-year free subscription of all Symbolium instruments ($194 value each). 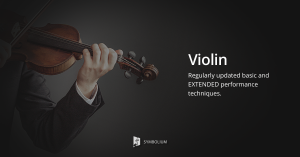 Additionally for prizes 4-6: One-year free subscription for Symbolium Violin package ($53 value each).